This spiced, green tomato cake is surprisingly delicious, and it's a great way to use green tomatoes before the frost gets them. If you're looking for something to do with the last of the green tomatoes besides fried green tomatoes, green tomato relish, chow chow, or fritters, try this sweet green tomato cake. In a large mixing bowl, combine the sugar, vegetable oil or shortening, eggs, and vanilla; beat until smooth and creamy. Sift together the flour, salt, baking powder, cinnamon, and nutmeg; slowly beat into egg mixture. Blend well. Stir in pecans, raisins, and tomatoes. Pour into the prepared baking pan. 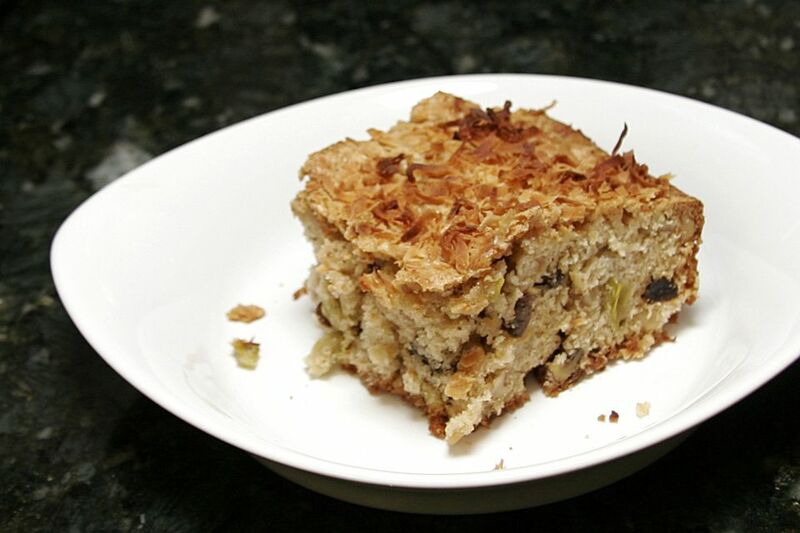 Top with coconut if desired. Bake for 55 to 65 minutes, or until a wooden pick or cake tester inserted in center comes out clean. Instead of raisins, try brickle bits, chocolate chips, dried cranberries or blueberries, chopped dried apricots, or golden raisins. Frost the cake with a cream cheese frosting or a simple sprinkling of powdered sugar. Replace the cinnamon and nutmeg with 1 1/2 teaspoons of apple pie spice or pumpkin spice blend.